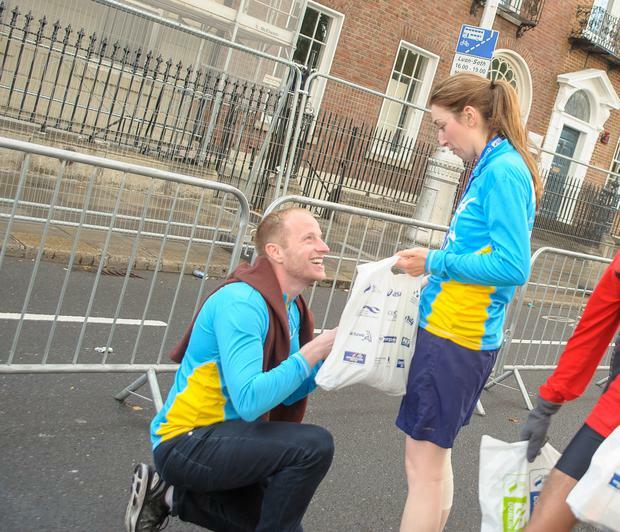 Romance was the real winner of the Dublin Marathon with one runner passing the finish line to get down on bended knee to win a ‘Yes’ from his girlfriend. Shane Callaghan, 28, from Carlow, set his plan in motion to propose to girlfriend Marguerite Kinsella, 32, earlier this year, when he signed the Mater Hospital nurse up for the 42 km run without her knowledge. And as he set about helping her train for the event, his second marathon, Shane, kept his proposal a secret from everyone, aside from asking for the blessing of his and Marguerite’s parents. “I got the idea back in May,” Shane said. “I’d been training for the marathon and Marguerite had never done a marathon but said she always liked the idea, so I signed her up and we started training together. Shane finished the race after 3 hours 49 minutes and went to get changed and plant himself at the finishing line with ring in hand for Marguerite. She finished the marathon after 4 hours 50 and was stunned when she saw her partner on one knee. “I thought he’d hurt himself,” Marguerite said. “I went over to see he was okay but then he proposed. Farm adviser Shane had been “so supportive” during training for the marathon, Marguerite said. “I remember going into work and getting an email saying I was going to the Dublin Marathon and I wanted to kill him. “But he gave me the confidence and support to know I could do it. I think he was expecting me to be crying and exhausted at the finish line but honestly, it wasn’t as bad as I thought it would be. The couple have been together for two-and-a-half years and met in a bar in Carlow on a night out with friends. Though Shane had kept the proposal a secret, he finally revealed what he was up to his sister in the final moments, as she was in the crowd with his mother. She traced where Marguerite was on the Dublin Marathon app on her phone, so Shane would know when to expect her at the finish line. “The security were wanting me to move on, so I had to explain to them I was waiting to propose to my girlfriend and they got on board,” Shane said. There was only one slight hiccup during the day. The promise ring Shane had bought Marguerite was too small to fit comfortably on her finger, so yesterday the couple went shopping in Dublin to buy the perfect engagement ring before heading home to Carlow. 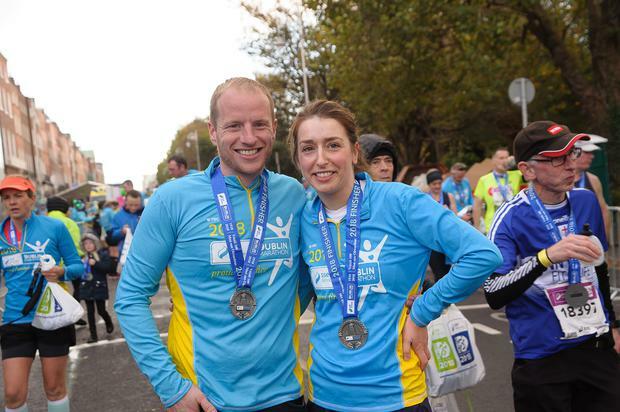 Marguerite ran to raise funds or ICU Steps, an intensive care support charity and Shane raised funds with Pauly’s Bootcamp in Carlow, who were at the marathon to raise money for a Carlow 7-year-old Callie Kavanagh. The child has been diagnosed with rare cancer Ewing’s Sarcoma. The funds, still being counted, will go towards helping her get her wish of going to Disney World.